Do you have hard-to-read content? When visitors come to your website, one of the characteristics they value most is readability. Keep in mind that not everyone that visits your site will know all of the technical terms surrounding your industry. If you are going to utilize technical terms, be sure to explain them on first reference so that your readers can understand. Better yet, save the technical terms until you’ve got them on board with your services. If you’re unsure of how to write amazing content for your industry, check out our five tips on how to write SEO content. Is your page overtaken with ads? Ads are becoming increasingly annoying to Internet users. Your potential customers don’t want to spend time on sites that are ad-heavy, and for most businesses, it’s best not to have them at all. Visitors are more likely to stay on your page if they don’t have to skim through ads to see the content they are looking for. If you want to place ads anywhere, consider targeting your most qualified customers with Google ads. WebFX offers a wide variety of ad services, and we even offer a free PPC audit to help you get started! Does your page take more than 3 seconds to load? Any page that takes longer than three seconds to load loses nearly half of its traffic. This means that if your site is slow, you could lose half of your potential customers – and send them right back to the search results where they’ll find one of your competitors. On mobile devices, the time frame is a little more forgiving, and pages are usually abandoned by 74% of people after 5 seconds. Still, load times are important – and if yours aren’t fast, you could be losing customers. Do you have too many calls to action? Though it is extremely important to have calls to action on your site, too many can be overwhelming. If visitors feel like they are bombarded with buttons asking for their information, they may be confused about which to choose – or worse, annoyed by the overly-salesy feel. This image shows the perfect balance of what you should have on your page as far as calls to action. The buttons displayed are easy to find and they allow a place for visitors to act on their interest in your service. The calls to action are shown in a way that doesn’t push for personal information, but rather provides the visitor with an option to contact when they are ready. Do you have videos that play when your page first opens? Think back to the last time that you opened a site that blasted your speakers with an automatically-played video clip. Were you happy about not pressing play, but seeing and hearing the video anyway? Many visitors to your site will be extremely annoyed if your site does this, and will bounce almost immediately. You may think it’s a perk to play the info for your visitors, but it’s actually quite the opposite. Turn off autoplay, and let your visitors decide whether or not to watch your video content. 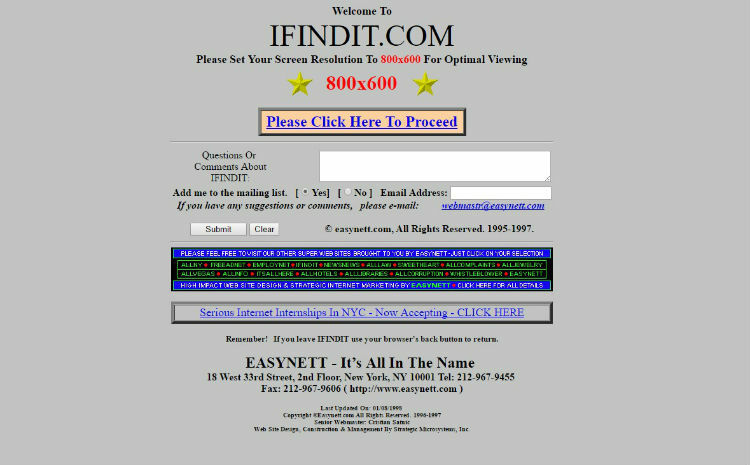 Does your web design look like it’s from 1999? As the world becomes increasingly technologically advanced, Internet users have certain expectations of company websites – especially ones that they are considering hiring for a service. If your site is outdated or difficult to navigate, it’s time for an update. Work with a reputable design agency that can provide your business with a more modern look, and your visitors will be much more confident in working with you. Do you require too much of your visitors? The minute you require visitors’ personal information, you are almost guaranteed to lose a portion of them. More often than not, first-time visitors are looking to enter your site, find specific information, and leave. Later in the sales funnel, it’s okay to ask for information like their name and email address, but at the start of the process, your job is to eliminate any hoops that might be involved – not create them. You can ask for information as part of your calls to action or newsletter signup forms, but don’t require it for the majority of your content. If you offer perks like this, don’t make them conditional. One of the biggest hassles for many Internet users is attempting to claim an offer, just to find more obstacles to navigate before actually getting it. If you won’t give a 20% voucher until your customer spends $1,000, list that stipulation up front! Otherwise, potential customers may leave your site frustrated and annoyed that you offered a deal or discount to get their information, then let them down. If your website has an overwhelming number of colors and graphics, it may appear busy and confusing to your visitors. In many cases, they’ll leave in search of a site that’s cleaner and easier to navigate. This can be a somewhat subjective quality, but it’s always a good idea to have people outside of your company test your site. If they find it confusing or difficult to find information, it may be time to rethink your design. Do you use overly dramatized stock photos? Bad stock photos are perhaps one of the worst things to include on a professional website. Not only do they appear spammy, but they also make it look like you don’t have the resources to take images of your own business. Images can help to illustrate your business and what it can do for customers, but if they’re obviously staged, you aren’t doing your site any favors. Instead, consider hiring a photographer to take high quality images of your office, products, or past projects. Do you hide the price of your services? One thing that customers look for when they are seeking services is a transparent website that offers straightforward pricing information. If you choose to make visitors jump through hoops in order to see the cost of your service, you will likely lose many potential customers. Most often than not, visitors to your site are doing just that – visiting. This means that many will simply be researching and looking to find information on your service to compare to other services. Offer them pricing information so they can quickly get on with their process and be one step closer to picking your company to serve them. Are your pages difficult to navigate? There’s nothing more frustrating than visiting a website where you can’t find what you’re looking for. One of the most important qualities in any website is easy navigation throughout. Easy navigation is also an SEO best practice to follow. Think of the last time your visited a website and couldn’t find what you were looking for. It is extremely easy to become frustrated when you visit a website for one thing and can’t seem to find it. This is why ease of navigation is so important. In order to ensure easy navigation, be sure to have a navigation bar that stands out from the rest of your page. Use logical organization for the difficult types of pages on your site, and have several people test it before launching it on your site. If you have a lot of product pages, it’s also a good idea to include a search bar so that customers can easily find the specific items they’re interested in. Do you make customers determine their next steps on their own? Not every site visitor is immediately ready to convert – but for the ones who are, it should be obvious how they can do so. If you are serious about selling your services, you will have a call-to-action on every page of your website. These can be as simple as buttons with text like “call now,” “visit us today”, or “tell me more.” All of these phrases encourage your visitors to make the next move in committing to your service. To ensure that your visitors can contact you from every page, with each of these calls-to-action, you should also have a field for the visitor to fill in their e-mail address. Even if they are just a little interested, after they disclose their e-mail, you can stay in contact with your newsletters or special offers. This also gives you the opportunity to personally reach out, which is always better than a bulk email. This is an example of exactly what you don’t want to sound like to customers. If you don’t write your website in a way that shows potential customers compassion for their needs, chances are they won’t want to work with you. Is your site confusing to navigate on mobile devices? Today, more Google searches take place on mobile devices than desktop computers. This means that your potential customers are searching for information on the go, and they need to be able to access it from their smartphones and other devices. The only way to ensure this is with responsive design, which allows your site to adapt to any browser and screen size and provide a great user experience. Although it may require some extensive development work if your site is not currently mobile-friendly, it’s worth your time and resources to be able to reach more potential customers. Does your site have any of these issues? If you answered “yes” to any of the above questions, you have some work to do on your site. On the upside, it also means that you have plenty of room to improve your online presence and attract even more customers. If you’re looking for a full-service agency that offers services including SEO content writing services, PPC consulting, ad remarketing services, and so much more, WebFX is here for you.